A new freestyle while we wait for his album’s September 2 release. 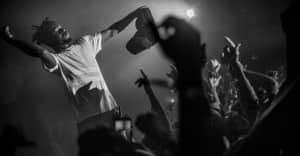 After sharing the video for his "Free Lunch" single, and mysteriously announcing a September 2 release date, TDE's Isaiah Rashad has returned with a new track which he clarified is a "freestyle" and not a single from his upcoming album. Rashad also hit the streets of Los Angeles on Friday to personally pass out literal free lunches to his fans. Listen to "I Mean," and see pictures from Rashad's "Free Lunch" event, below.